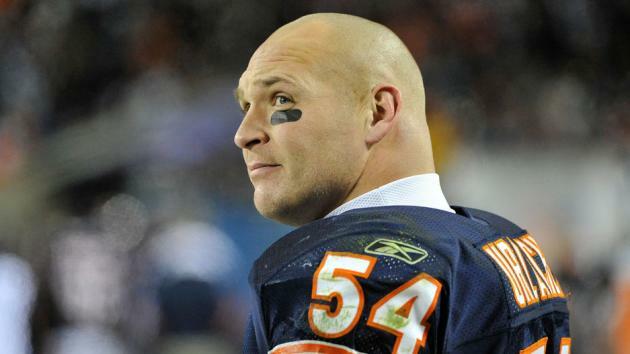 Wednesday, Brian Urlacher announced that he is retiring from the NFL after a 13-year career. Urlacher is retiring as a member of the only team he’s ever played for, the Chicago Bears. In March, the Bears opted not to bring Urlacher back for another season, and he lightly tested the market, but ultimately decided to leave the game. After spending a lot of time this spring thinking about my NFL future, I have made a decision to retire,” Urlacher wrote in a statement. “Although I could continue playing, I’m not sure I would bring a level of performance or passion that’s up to my standards. When considering this, along with the fact that I could retire after a 13-year career wearing only one jersey for such a storied franchise, my decision became pretty clear. I want to thank all of the people in my life that have helped me along the way. I will miss my teammates, my coaches and the great Bears fans. I’m proud to say that I gave all of you everything I had every time I took the field. I will miss this great game, but I leave it with no regrets. When Urlacher states how much he will miss his teammates, coaches and the Bears’ fans, it feels like a tremendous understatement. It is rare now for an athlete to spend their entire career with one team. The attachment he has and will continue to have to the City of Chicago will be lifelong, much in the same vein as one of his most esteemed Bears predecessors, Mike Ditka. Urlacher’s career stats stand at 180 games started, 1052, tackles, 41.5 sacks, 22 interceptions, and two touchdowns. Outstanding. The Chicago Bears play their home opener September 8, 2013 against the Cincinnati Bengals and one thing is for sure — a void will be felt across the entire city. And what a career it has been.